Although medical treatments are the only way to remove or eliminate varicose veins, there are several lifestyle changes and natural remedies that may provide some relief from your varicose vein symptoms. If you have varicose veins, there are several lifestyle changes that you can make to relieve your symptoms right away. Elevate the legs. One of the easiest ways to reduce varicose vein symptoms is to elevate your legs above the level of your heart. This encourages the blood to drain out of the veins in the legs, which reduces pressure on the vein walls and valves. You can elevate your legs while lying on a bed or the floor by placing pillows or yoga blocks underneath the feet. Or you can lie on the floor with your bottom near a wall, and bring your legs up onto the wall, keeping the legs almost straight. Try doing this for 10 to 15 minutes several times a day. Increase dietary fiber. Some studies have found that straining while having a bowel movement may increase the chance that you develop varicose veins. However, other research hasn’t seen a link between dietary fiber and varicose veins. More research is needed before doctors fully understand this. What we do know is that obesity puts you at risk of varicose veins and can worsen your symptoms. Eating more dietary fiber can help you maintain a healthy weight. To add more fiber to your diet, choose whole grains, and fruits and vegetables. Try water therapy. A few small studies found that water therapy (also known as hydrotherapy or balneotherapy) may relieve symptoms of varicose veins or chronic venous insufficiency, another type of vein disease. In the studies, these techniques were monitored by professionals and involved soaking the legs in hot water, or alternating hot and cool water. Some studies also had people walk or receive a massage in between the soaking sessions. Horse chestnut seed. Extracts taken from the seed of the horse chestnut (Aesculus hippocastanum L.) may reduce swelling in the lower leg that occurs with varicose veins and chronic venous insufficiency, along with symptoms such as pain, heaviness and itching. Studies have found that the extract works well as an oral tincture, tablet or topical gel. 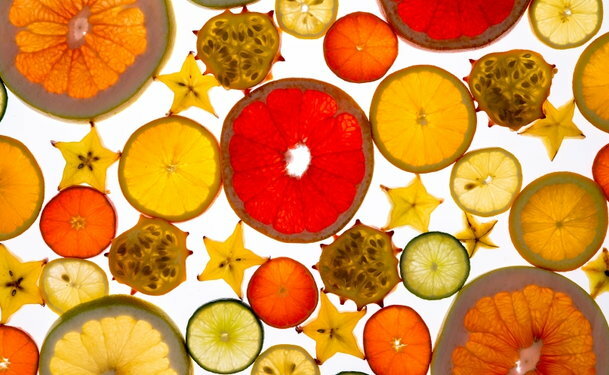 Citrus fruits: Oranges, limes and lemons all contain vitamin C, flavonoids and other healthy nutrients. These foods encourage the normal flow of blood through vessels. Vitamin C is also needed by the body to make blood vessels. One flavonoid found in orange peels (hesperidin) may help reduce symptoms of varicose veins, such as swelling and cramps. Grape seed extract. A compound found in red grapes known as proanthcyanidin may relieve the itching, heaviness and pain that comes with varicose veins. It may also reduce swelling in the lower legs. Butcher’s Broom. Also known as Ruscus aculeatus, compounds in this plant may relieve symptoms of varicose veins, such as itching, swelling, cramping and strain in the legs. It works by reducing the leakiness of blood vessels, which may also decrease swelling in the tissue around the varicose veins. Varicose veins are swollen, twisted veins visible just beneath the surface of the skin. They occur when the valves or walls of the veins don’t work properly. This leads to blood pooling in the legs, along with symptoms like swelling, aching, heaviness or in severe cases, open sores (ulcers). If you are using any of these herbal compounds or supplements, be sure to tell your doctor or vein specialist. Some of them may interact with other medications that you are taking. These and other natural remedies are only meant to reduce the symptoms of varicose veins. The best way to eliminate your varicose veins is with medical treatments such as sclerotherapy or endovenous laser ablation. A vein specialist can diagnose your vein condition and offer the best treatment plan for you.